The second jobs report of 2017 showed that the economy continues to trend positively. 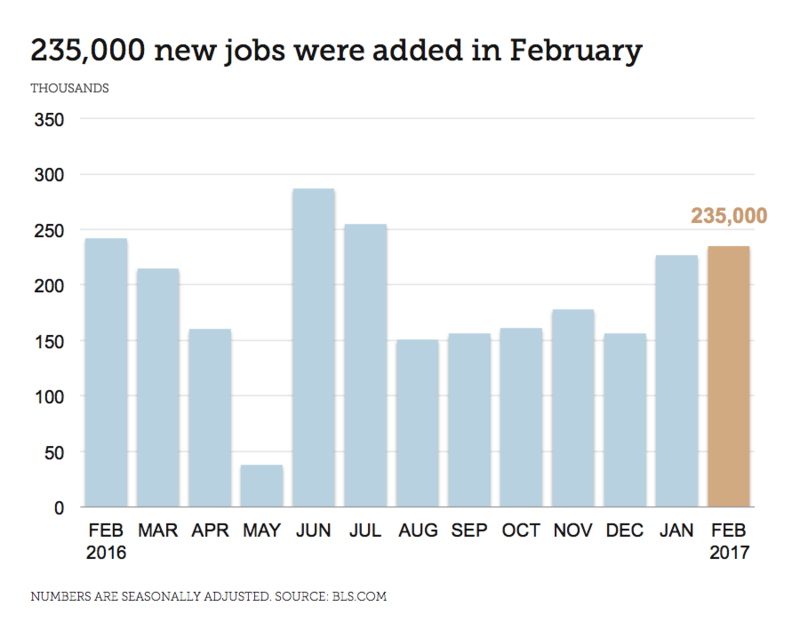 The Labor Department reports that 235,000 jobs were added in February. The unemployment rate dropped slightly to 4.7 percent, down .2 percent year-over-year. The actual number of jobs added far exceeded the predicted number of 190,000, and as a result, there is an increased likelihood of a rate increase by the Fed when they meet next week. Despite this, emerging-market currencies surged following the report’s release. In February, jobs were added in construction (58,000), private educational services (29,000), manufacturing (28,000), health care (27,000) and mining (8,000). The change in total nonfarm payroll employment for December was revised down from 157,000 to 155,000, while January was revised up from 227,000 to 238,000. With these revisions, employment gains in December and January combined were 9,000 more than previously reported. Job gains have averaged 209,000 over the past three months. President Trump’s first full month saw a large increase in jobs, an indication that the economy is very healthy right now. However, economists say that it will be very difficult for Trump to fulfill his promise to create 25 million jobs over the next 10 years amid an already-low unemployment rate and Boomers retiring at rapid rates. It is also uncertain how a rate hike by the Fed would impact the growth trend. Economists predicted 190,000 additions ahead of this morning’s jobs report and the report exceeded expectations with 235,000 jobs added. Let’s break down the numbers from this month’s jobs report. In February, hourly wages increased by $0.06 to $26.09 per hour, following a 5-cent increase in January. This brings the year-over-year wage percentage increase to 2.8 percent. The unemployment rate saw a slight decrease to 4.7 percent. The unemployment rate for financial services increased slightly and now sits at 3.4 percent, which is a .2 percent decrease year-over-year. This average sits far lower than the national average. While the low unemployment rate is great news for legal and accounting and finance job seekers, for employers, it means that hiring top talent is going to be challenging. To get ahead of your competitors and add exceptional professionals to your workforce, make sure you are offering a competitive salary. Request a free copy of our 2017 Legal or Accounting and Finance Salary Guide — a comprehensive resource for salaries across your industry — to get the latest salary insights that will help you hire the top professionals in your industry.